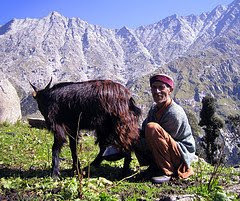 Gaddi Tribes constitute a sizeable population of tribes habitating in Himachal Pradesh. These tribes mainly dwell around Dhauladhar mountain range, Chamba, Bharmaur and the areas near to Dharamshala. It is believed that these people migrated to the foothills of Himalayas from Central Asia, Rajasthan and Gujarat. It is also believed that some castes of Gaddi tribes ran away and took shelter in hills because of the threat of Mughal ruler Aurangzeb in 17th century. The pace of evolving changes with time, in contemporary society, has also affected the living style of Gaddi tribes, which poses a great threat to their culture, costume, jewellery, folklore and lifestyle. Characteristics of Gaddis are diminishing fast because of the cultural invasion by other communities. The main occupation of Gaddi tribes is shepherding and they make their livelihood by rearing and selling sheeps, goats, mules and horses. Though these tribes were more nomadic in older days but now they have made their settlements in the villages and make seasonal movements with their livestock to pastures in upper hills during summer season and to the foothills in chilly winters. Now people from Gaddi community have also started adopting several other occupations for earning their livelihood. Related with the occupation of sheep grazing, Gaddis flaunt woolen attire made of sheep wool, like woolen pyjamas (trousers), long coats, dhoru (woolen sari), caps and shoes made up of wool and goat hair. Even sheep wool is also used for making shawls, blankets and carpets which are spun in traditional style at homes as they are expert in weaving. Gaddi women are also fond of jewellery made of semi precious stones, gold and silver. Though most of the Gaddi community is Hindu, but one can also find Muslim Gaddis in the upper areas of Chamba and Lahaul Spiti districts. Where these tribes speak in local dialects, they can also understand and converse in Hindi as well. Gaddis are also known for their simple living style and are religious. Most of them still practice their old traditions and customs. They are also fond of music and dance and their important fairs are Minjar, Bharmaur Jatra and Sui Mela. They are worshipers of Lord Shiva and also celebrate Shivratri festival with pomp and show. Most of the people in Gaddi tribe are non-vegetarians and they also consume goat milk. Though in the earlier days child marriages and polygamy were in practice but with the change in lifestyle the community has also grown up educationally. Good to see the depth of information you had gathered about Gaddi community. Awesome information about gaddi tribe...can add some more info. about their living style and progress. Regarding the "uprooting from Rajasthan during 17th century". I am not satisfied with this line as if you go to Bharmaur, you will find 1000 years old stone statue of their Gods and Goddess, then how can you tell that they shifted from Rajansthan because of Mughal invasions. I am agree with Vishal becouse its not a true information. Gaddies have been living in Bharmour before 17th century and also wrong information about religion. Gaddies are anly hindu. it is a very helpful information about GADDI tribe, The GADDI tribe from uttar pardesh is muslim, I want know their caste specially the gaddi,s from karnal migrated to pakistan callled as gadi not gaddi!!!! Hey, I liked your article. I am going to make a request. in case you want to contact. Nice to see that Someone has gathered some information about Gaddies but It needs to be edited a lot ,As we haven't mentioned about the Origin of Gaddies ..As i have heard When Mughal Entered in India they were forcing people to Adopt their religion so These people left their places to save their women and children from victimization and the went to upper hilly Area of Himalaya and made their own Clan . Most of the Gaddies were Rajput and Brahmin ..
Hi i am interested in conducting research on the gaddi tribe specifically on the gaddi women called sadhin who forgo marriage and dress as men but i have not been able to find much information on them apart from a few articles. do you have any such information or any idea about where i could access such information? Was very informative for my social science project, as I am a student of grade IX.